Guaranteed not to hollow or groove, DMT®’s precisely engineered Dia-Sharp® Bench Stone with continuous diamond surface assures consistent, even sharpening every time. 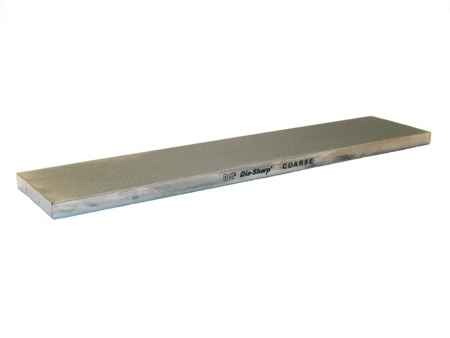 The 11.5" x 2.5" Dia-Sharp® Bench Stone provides long stroking areas and cutting edge performance for a quick, keen edge on small contact areas and pointed tools. May be used to flatten conventional and water stones. Includes non-skid rubber feet. Diamond grit clearly marked on side of stone. Choose from the following grits: extra-fine, fine, coarse or extra-coarse. Extra-Coarse diamond to repair a damaged edge.